This is like Chinese take out without the grease! 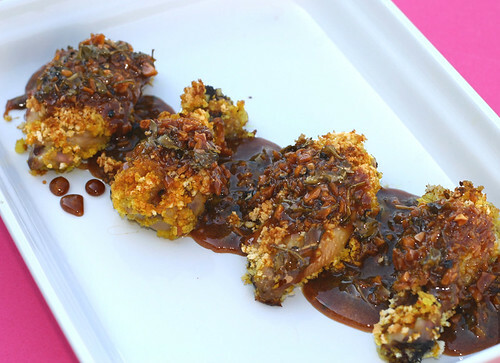 Chicken wings are baked in the oven with a crisp coating then doused in a sweet and savory sauce that’s to dream for! Truly ADDICTIVE! 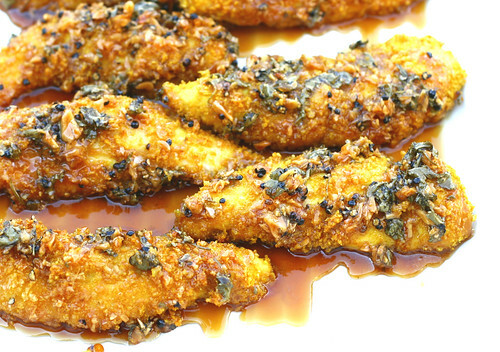 As you can see this recipe works great on boneless skinless chicken tenders too. I adapted this recipe from the cook book Fire & Spice by Jacki Passmore Patty had given it to me years ago and I finally decided to nail down one recipe – lucky me – I chose a REAL WINNER! The original recipe is much hotter and the chicken was battered and deep fried. zip up bag (leaving the air in) and shake to distribute evenly. Place on sprayed baking sheet and bake at 425º for 20-25 minutes on each side (just 10-12 min on each side for tenders). **CRACKED Black Peppercorns are not that hot. using regular or Course ground pepper would be TOO HOT! If you can’t find CRACKED Peppercorns you can make them by putting whole peppercorns in a bag and crushing them with a rolling pin. The pieces should be fairly large. Stirring constantly, bring to heavy simmer/boil for 15 min. until slightly thickened. Dunk each cooked tender in sauce with tongs or place tenders on tray and drizzle sauce over top. If I wasn’t making your Chicken and Dumplings for dinner, this would be my choice! Oh my! That looks absolutely wonderful Mary!! I was looking for some recipes using tumeric – thanks! Katy left me an email about the pepper. My response: I updated the recipe to explain CRACKED peppercorns. Then I laughed too because I omitted about 10x the heat of different peppers from this recipe in the first place because the original was way too hot. The title of the cook book IS FIRE & SPICE! Even with the wrong kind of pepper, this was really good! Second day leftovers were great, too. I left the sauce on to boil for too long, so some of it candied. Next time I’ll wait for it to thicken and not leave it on any longer. A real winner. Both Carolyn and I really liked it. That’s looks great. I am going to try this tonight. This chicken looks amazing- I am not a fan of chicken breasts, but could probably use boneless thighs as well! This looks so great. Love that it’s baked! i love chicken wings! especially these flavorful, crispy, delicious ones! I am totally making this…You guys ROCK OUTLOUD!!! Oh Miranda you really won’t regret making this one – honestly it’s like crack cocaine to a junkie! I can use chicken wings and this can go with cous cous. YUM! Mmm.. this look sticky, gooey, good! Mary, these look simply amazing! A wonderful new way to cook up wings for the big game! I like that these aren’t fried also. Whenever I do my buffalo wings I always either grill them or bake them on a rack over a cook sheet. Who needs the mess and all that fat! Great recipe. Used to go to an amazing Burmese restaurant in San Francisco–wonderful flavors…now I am craving these, and the vegetable samosas. Man, does this look great. I’ve never been to Burma, but we’ve had Burmese food in Malaysia and Thailand. Wonderful. Thanks, this one goes in the recipe box. Hey Jeanette Welcome! – I’ve only been to the Northern boarder of Burma and have gorgeous photos and a blanket to show for it. I actually got to the Malaysian boarder, but couldn’t cross because my co-workers forgot to tell me to bring my passport with. It was a LONG torturous ride from Chon Buri, Thailand – but I was invited to a wedding wayyyyyyy out in the middle of nowhere with the rice farmers – wow – that was in ’89 – but seems like yesterday! Thanks for giving me a great memory today! Am I missing something? These look really easy to do and the flavor combo sounds amazing! I’m craving for this right now. I know it may not be appropriate but I want to eat this while watching DVD at home.